Jane Ann Smith, 87, passed away at home on Thursday, March 29, 2018. Jane was born on March 31, 1930 in Stamford, CT, to Dr. Frank and Muriel Fisher. She graduated from Pascagoula High School, MS in 1949. Jane graduated from Mississippi State College for Women (MSCW) with a bachelor's degree in education and went on to teach math at La Porte Junior High School. On May 4, 1958, she married Robert J. Smith at the Presbyterian Church in La Porte. Jane is survived by her husband, Robert; 2 sons, Robert J. (Sarah) Smith, Jr. and Thomas K. (Terilynn) Smith; and 4 grandchildren, Kaitlyn, Calleigh, Kristen, and Tommilyn. She was preceded in death by her parents; beloved son, Timothy Smith; and her brother, George Fisher. In her younger years, Jane was an active member of Tri Kappa, her library club, the 4-H extension homemakers' club, and the Red Hats. 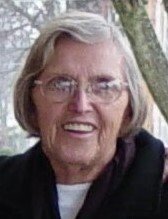 She taught Sunday school for the First Christian Church of Rolling Prairie. She enjoyed winters in Florida, knitting, reading, playing bridge, and gardening. Jane also enjoyed her days at Hudson Lake, especially on the pontoon boat. A Celebration of Life Service will be held at 11 AM (CT) on Tuesday, April 3, 2018 at Cutler Funeral Home and Cremation Center. Burial will follow at New Carlisle Cemetery. A time of visitation will be held from 4 - 8 PM (CT) on Monday, April 2, 2018 and from 10 AM (CT) until the time of the service on Tuesday at the funeral home. Memorial donations may be made to First Christian Church of Rolling Prairie, 113 W. Michigan, Rolling Prairie, IN 46371 or the donor's choice.